A solidly-researched, well-conceived, and original study that contributes richly to the literature of American Jewish life in the twentieth century. 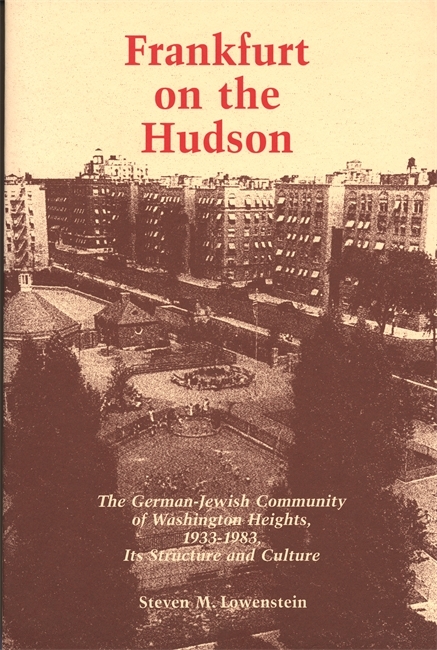 The 20,000 German Jews who fled Hitler's Germany and settled in Washington Heights were unusual in many ways. They preserved their Jewish identity while fostering a culture that was still heavily German—a difficult combination in light of their origins. In his study of this immigrant group, Steven Lowenstein strives for more that a chronicle of their institutions and leaders. He analyzes both the social structure of the community and the folk culture of the immigrants. He deals with such issues as the formal nature of German Jewish cultural style, the relationships between the generations, and intergroup relations. Using organizational bulletins, surveys, interviews, and personal observations and anecdotes, Lowenstein paints a picture of a unique lifestyle now in the process of merging into American Jewry and disappearing. Steven M. Lowenstein is the Isadore Levine professor of Jewish history at the University of Judaism in Los Angeles. He earned his Ph.D. from Princeton University and is the author of Two Sources of Jewish Tradition: The Official Religion and the Popular Religion. He has also written numerous articles on the social and cultural history of Germany Jewry for scholarly journals. Lowenstein has deftly and compassionately written an excellent cultural history of the community in which he grew up.